A stock that trades at a relatively low price and market capitalisation. These types of stocks are generally considered to be highly speculative and of high risk because of their lack of liquidity, large bid-ask spreads, small capitalization and limited following and disclosure. CAPSTOCKS shall permit clients to buy/sell in penny stocks, subject to the risk management policy of the Company. CAPSTOCKS, reserve the right to permit or refuse limits in Penny stocks and losses if any, on account of such refusal, shall be borne by the Client himself. CAPSTOCKS may from time to time impose and vary limits on the orders that the Client can place through its trading system (including exposure limits, turnover limits, limits as to the number, value and/or kind of securities in respect of which orders can be placed etc.). The Client is aware and agrees that CAPSTOCKS may need to vary or reduce the limits or impose new limits urgently on the basis of its risk perception and other including but not limited to limits on account of Exchange/SEBI directions/limits (such as broker level/market level limits in security specific/volume specific exposures etc.) and that CAPSTOCKS may be unable to inform the Client of such variation, reduction or imposition in advance. The Client agrees that CAPSTOCKS shall not be responsible for such variation, reduction or imposition or the Client’s inability to route any order through the trading system on account of any such variation, reduction or imposition of limits. The Client agrees that the losses, if any on account of such refusal or due to delay caused by such review, shall be borne exclusively by the Client alone. In case of exposure taken on the basis of share margin, the payment is required to be made before the Exchange “Pay In” date otherwise it will be liable to squared off after the “Pay In” time or any time, due to shortage of margin. Brokerage and other charges are subject to the maximum limits as prescribed by SEBI/Exchanges/Government and other Regulatory authorities, from time to time. The Clients are liable to remit the pay-in / margin obligation, for their positions held in the F & O Segment. As per SEBI circular no. CIR/DNPD/7/2011 dated August 10, 2011, Exchanges are bound to levy penalty on Trading Members, for any shortage of margin or non collection of margin, in the derivatives segment (F & O and Currency Derivatives segment) with effect from September 01, 2011. CAPSTOCKS, reserves the right to transfer / pass on, the said penalty, to the respective client who shall be liable for the payment of such charges, at such rate as may be prescribed by CAPSTOCKS, in accordance to SEBI/Exchange norms. CAPSTOCKS shall at its sole discretion square off/liquidate open positions of Clients and/or sell Clients Securities, in the event of his/her/its failure to meet Margin/Pay-in obligations/Outstanding debts, etc in time. The Securities to be sold shall include those maintained as Margin and/or Securities lying in the Pool Account and/or Client’s Demat account. CAPSTOCKS shall be under no obligation to communicate such Close Out of positions or Sale of Securities and shall not be held responsible for any losses incurred by the Client due to such squaring off /sale or for not doing so. Any and/all losses and financial charges on account of such liquidation/closing out shall be charged to and borne by the Client. It shall be the responsibility of the Client to ensure timely availability of funds/securities at designated time and in designated bank or depository account(s) for meeting his/her/its, pay-in obligation of funds/securities. In case the margin/security is made by the Client through a Bank instrument, the CAPSTOCKS shall be at liberty to give the benefit/credit for the same only on realization of funds, from the said bank instrument. CAPSTOCKS shall not be obliged to deliver any securities or pay any money to the client unless and until the same has been received from the Exchange/Clearing Corporation/Clearing House or other Company or entity liable to make the delivery/payment and the Client has fulfilled his/her/its obligations first. The shortages in obligation arising out of internal netting of trades will be settled by purchase from the market or by squaring off, at the discretion of CAPSTOCKS, subject to SEBI/Exchange Rules & Regulations. All losses to the Client on this account shall be borne solely by the Client and the Client shall also indemnify CAPSTOCKS in this respect. Securities breaching the limits specified by the Exchanges/Regulators from time to time. In case of failure to meet margin including mark to market margins. Due to any force majeure event beyond the control of CAPSTOCKS. CAPSTOCKS shall not be responsible for any loss incurred due to “Close Out” and the Client shall indemnify in this regard. CAPSTOCKS may temporarily suspend/close a Client account, upon the request of the respective Client in writing. The Client account shall be reactivated again on his written request, subject to the clearance of all dues/settlement obligations. In case of closure of account the Client may be required to comply with fresh KYC registration formalities. Notwithstanding any such suspension/closure, all rights, liabilities and obligations of the parties arising out of or in respect of transactions entered into prior to such closure / suspension shall continue to subsist and binding on the Client. Deregistration of the Client shall be at the sole discretion of CAPSTOCKS. CAPSTOCKS may deregister the Client, if the Client breaches the terms and conditions of the Member - Client Agreement or provides any false information or declaration at the time of Client Registration. Further CAPSTOCKS may deregister the Client if the Client is suspected to be involved in any activities, in violation of applicable Rules and Regulations. The Client may also be deregistered due to any regulatory directive and other internal policies of CAPSTOCKS, including policy with respect to prevention of money laundering. Such deregistration/ termination shall not affect the rights and liabilities of the parties in respect of the transactions, executed before the date of such deregistration / termination. The Trading Account and/or Demat account of a Client shall be treated as inactive, if it remains inoperative for a continuous period of twelve months. The shares/credit in the ledger, if any shall be transferred to the Client Account, within one week of Client being identified as inactive.The Constituent Client shall thereafter be prevented from any further transaction. An inactive account can be reactivated by submitting a duly signed request along with the requisite proofs, at any of the Branches/H.O of CAPSTOCKS. It is hereby declared that we do Client based Trading and Pro Account Trading in NSE/BSE/MCX-SX Stock Exchange (s). Complete the Know Your Client (KYC) Form, read through Member. Client Agreement (MCA), Risk Disclosure Document (RDD) and execute them. In case you are dealing through a sub-broker, you need to execute a Tripartite Agreement i.e. an agreement between Client-Sub-Broker-Trading Member. Please provide proof of your identity, proof of your address and also a copy of the Permanent Account Number (PAN) card. Get a Unique Client Code allotted by the Trading Member to you. Before handing over the documents to Trading Member or his authorized representative retain a copy of all documents for your future reference. Choose an Exchange of your choice. Strike off the name of the Exchange on which you do not wish to trade. Check and clearly mark your option to receive order confirmations, contract notes and funds and securities statements in digital or physical form. The conditions for receiving digitally signed documents are understood. The e-mail id regularly used by you is provided. The Trading Member acknowledges your e-mail id. Specify your name and client code before placing orders. Be specific and clear in terms like quantity and price. Do not give blanket permission to place orders on your behalf. Make sure that orders given by you are entered in your Unique Client Code (UCC) that has been allotted to you. Make sure that you receive contract notes for all your trades from the Trading Member within the stipulated time of 24 hours from the execution of trade. In case you have opted for digital contract notes, please verify your email account on a daily basis so that all transactions in your account come to your knowledge. Give and receive all funds to Trading Member’s account only. Make payments only by way of Account Payee cheque/demand draft/pay order in favour of Trading Member. Make sure that you receive quarterly statement of funds and securities from your Trading Member. Review the statements for accuracy. In case you decide to stop trading for a specific period (in case you are traveling / under going medical treatment, etc) intimate the Trading Member in writing and take an acknowledgement for the same. In case you decide to close your trading account, ensure that you have completed the formalities and received a closure letter from the Trading Member. Verify your trades on a regular basis. Check transactions in the contract notes or the quarterly statements of funds and securities. If you notice that any transaction is not as per your instructions, raise the issue with the Compliance Officer in writing. To facilitate Risk Management, it is essential to have an online mechanism that would generate alert, keeping in pace of the change in the Clients position, on a real time basis. For this purpose, “CAPSTOCKS” have installed a state of the Art surveillance program, called “Protector”, specifically developed for the broking environment, by Financial Technologies, a leader in this field. The software tracks the trades of each client, as and when they happen, and calculate his/her margin, using the NSE’s SPAN margin software. The alerts generated are monitored by a Surveillance team who then instruct the dealers to take appropriate action against the Client. The surveillance team monitors the online trades as they are executed,and extra ordinary volume in the particular scrip or client is immediately brought under its scanner. The surveillance team shall conduct investigation by calling up the sub broker / branch, for the details of clients. The track record of the Client, his previous purchase or sales transactions are also looked into, by verification of Ledger / Financial Statements. 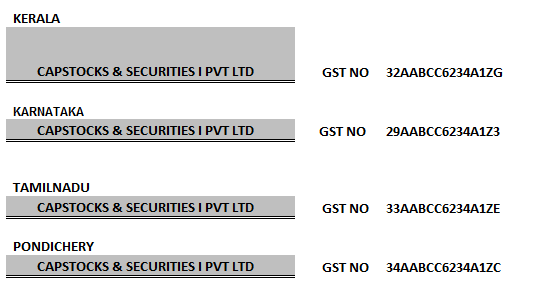 “CAPSTOCKS” have allocated group limit for A, B1, B2, T, TS and Z group. The Surveillance Team gives limit in a very conservative manner, especially, illiquid scrips. Trading in such scrips are discouraged and allowed on a case to case basis, based on the level of confidence in the client. Any limit accretion requests are first investigated and upon being satisfied with the bonafide of the trade as well as the client, limits are accordingly increased. Unusually large volume is checked, especially if the client has incurred a loss, or made unusually high profits. Where volumes are unusually high, they are compared with the total volume in theExchange for the day in that particular scrip, and such reporting is done to the Compliance Officer. Price movement over a 3 / 6 months period is also tracked. After due investigation (which normally takes two weeks), Surveillance Team reports to the Compliance Officer its finding and thereafter such scrip is disabled for trading for that client / branch and in some cases on the whole network. All the clients who have traded in the scrip, where there is unusual volume vis-a- vis average volume, are scrutinized for their other scrip dealings. Looking at the general quality of scrips that they are dealing in, Surveillance Manager reports to the Managing Director / Compliance Officer, for further action as to whether to continue to deal as a broker for that client or not. The back office software does have a module which tracks offline, the intra-day loss of all clients. The Surveillance Team prepares & scrutinizes the statement to look at any unnatural volumes, in scrips without delivery. The Surveillance team shall keep track of alerts generated and also received from the Exchange end, on a real time basis. The alerts generated / received are documented and recorded in a register, for review and analysis. The time frame for disposition of alerts is 15 days from the date of receipt of the alert. Any delay in disposition of alerts shall be recorded, with reasons for the same. Any suspicious / manipulative activity shall be immediately brought to the notice of the Compliance officer / Managing Director. In case adverse observations are recorded, then Surveillance Department shall report such instances to the Exchange / authorities within 45 days, of the alert generation. The Surveillance department shall also put up to the board on the number of alerts pending at the beginning of the quarter, generated during the quarter, disposed off during the quarter and pending at the end of the quarter. The board shall also be apprised of the any exception noticed during the disposition of alerts. The surveillance process shall be conducted under the overall supervision of the Compliance Officer. The designated directors / compliance officers would be responsible for all surveillance activities and for record maintenance and reporting of such activities. The Internal Auditor shall review the surveillance Policy, its implementation, effectiveness and review the alerts generated during the period of audit. The information and material contained in these pages and the terms, conditions, and descriptions that appear are subject to change without prior notice. The information contained in this brochure are provided on an “as is,” “as available” basis and “CAPSTOCKS” does not warranty the accuracy, adequacy or completeness of this information and expressly disclaims liability for errors or omissions in this information and material.